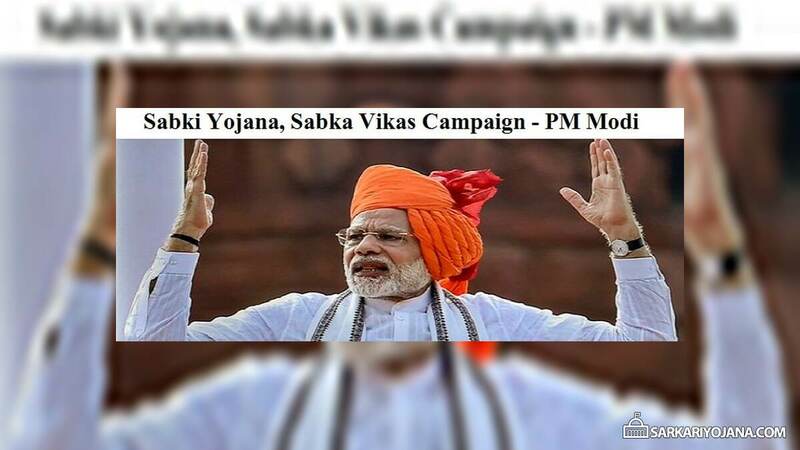 Central government is going to launch nationwide Sabki Yojana Sabka Vikas Campaign on 2 October 2018 (Gandhi Jayanti). 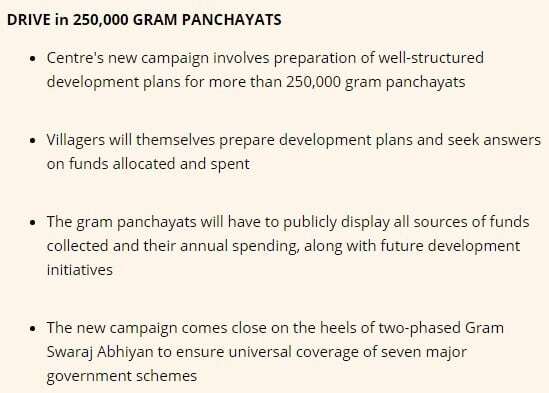 This campaign of PM Narendra Modi will cover around 2.5 lakh Gram Panchayats across the country. The main purpose of Sabki Yojana, Sabka Vikas Drive is to involve people at grassroots level and to prepare structured gram panchayat developmental plans. All the gram panchayats in 3 states will have to put up a notice board describing the work being done, funds received from all sources & allocation of funds. Even developmental activities to be carried out in near future (FY 2018-19) are to be mentioned. In gram panchayats, Gram Sabha Meetings will be held. In these meetings, trained assistants belonging to all 29 sectors of gram panchayats (11th schedule of Constitution) needs to remain present. These sectors will include agriculture, rural housing, drinking water, poverty alleviation programmes, social welfare, cultural activities, market and fairs etc. Village ‘Sakhis’ or MGNREGA support staff can also remain present as assistants. They will have to explain the work carried out in the last few years and their near future plans alongwith financial details. This is because Gram Panchayat developmental plans have been largely unorganised. So, govt. wants these plans to be more structured with the involvement of masses. This would enable people to know about the developmental activities and the progress made in the previous years. If all the allocated funds are utilized properly, then gram panchayats could become micro-models of development. After 14th Finance Commission (FFC) recommendations, an average big sized GP will have an annual budget of Rs. 5 crore. So if these funds are properly used, then a lots of developmental works can be carried out. Developmental plans of each GP will be shared with the Central govt. after the campaign is over. Letters are issued and sent to state chief secretaries to kickstart the programme. Restructured Rashtriya Gram Swaraj Abhiyan (RGSA) is being approved to be implemented till 2022. Panchayati Raj Institutions will make increased usage of e-governance to provide effective service delivery and transparency. Villages with higher SC / ST population and 117 identified aspirational districts lying at the bottom of socio-economic indicators will be given priority. In the 2 phased campaign of Gram Swaraj Abhiyan, poor people received 4.77 million new LPG gas connections, 3 million household electricity connections, 6.55 million LED bulbs, 7.35 million new Jan Dhan accounts and 5.04 million beneficiaries were enrolled in life insurance schemes. For pradhanmantri awas yojana (urban) when I am trying to fill, then format is asking for first the aadhar no. & then check. When I touching button then there is no follow up response. Now how I apply for the same. From UIDAI.GOV.IN I’m satisfied that my aadhar no. is exists.